For several decades, a growing chorus of experts have spoken of the urgent need to shift to a new “operating system” for humanity and planet earth. The burning question is how? 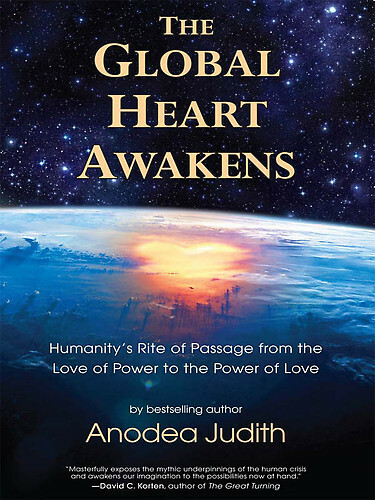 The Global Heart Awakens responds by offering a masterful prophetic vision—indeed, a bold new myth for our time. By digging deep into the past, and ranging far ahead into our promising future, Anodea Judith is able to call out our present ordeal: We are an immature species undergoing a profound global initiation into adulthood. This is a collective evolutionary rite of passage. Our current crises not only are initiatory ordeals but are what Barbara Marx Hubbard has called “evolutionary drivers,” which are demanding a shift to a new social organizing principle. I suggest that we will emerge into the next age of humanity in part because we have successfully endured the “Underworld” journey of these initiatory ordeals. I describe the stages of initiation as a metaphor for how we transform ourselves and our culture. These stages, though difficult, have an evolutionary purpose. What brought us to this turning point? And what will it take to mature as a species? To find out, Judith guides us on a journey, illuminating each passing era of human history with a rich variety of analytical schemes, including archetypal psychology, gender “valences,” and the seven levels of the chakra system—whose center and goal is the awakened heart. Judith concludes with a compelling vision of how the emergent organizing principle of the power of love will integrate the divorced polarities of masculine and feminine and heaven and earth—resulting in an exciting new synthesis that’s steering us toward harmony and wholeness. An earlier version of this book won the coveted Nautilus Award in Social Change in 2007. This new edition offers a thoroughly updated analysis of where we stand and points to the newest solutions now emerging on an unstoppable journey to planetary adulthood. Among Anodea Judith’s other books are Creating on Purpose: The Spiritual Technology of Manifesting through the Chakras and Eastern Body, Western Mind: Psychology and the Chakra System. For several decades, a growing chorus of experts have spoken of the urgent need to shift to a new “operating system” for planet earth. The burning question is how? The Global Heart Awakens responds by offering a masterful prophetic vision—indeed, a bold new myth for our time. By digging deep into the past, and ranging far ahead into our promising future, Anodea Judith is able to call out our present ordeal: We are an immature species undergoing a profound global initiation into adulthood. This collective rite of passage, Judith shows, will unravel our world system based on the love of power and deliver us to one based on the power of love. What brought us to this turning point? And what will it take to mature as a species? To find out, Judith guides us on a tour de force journey. She illumines each passing era of human history with a rich variety of analytical schemes, including archetypal psychology, gender “valences,” and the seven levels of the chakra system—whose center and goal is the awakened heart. Judith concludes with a compelling vision of how the emergent organizing principle of the power of love will integrate the divorced polarities of masculine and feminine and heaven and earth—resulting in an exciting new synthesis that’s steering us toward harmony and wholeness. An earlier version of this book won the coveted Nautilus Award in Social Change in 2007. This new edition offers a thoroughly updated analysis of where we stand and points to the newest solutions now emerging. Read this book and join Anodea Judith on an unstoppable journey to planetary adulthood.